I just attended Wayne’s “Unlocking LinkedIn's Corporate Marketing Potential” class and learned several new methods of using LinkedIn to build and market a business. 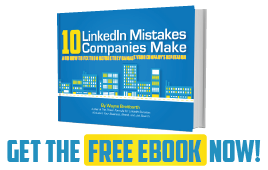 I also got numerous tips on how to create a LinkedIn company page. LinkedIn is a fantastic tool for marketing your brand and expanding your business, but your efforts will be more effective if you attend Wayne’s class and learn his helpful hints and suggestions. Where I think Wayne really offers the most value, and he offers a lot, is his ability to speak to both the new user, and the power user. I have been on LinkedIn for years, and I think I know it all. That is until I hear Wayne speak again. I always come away with several new action items to help my organization gain brand resonance through LinkedIn. I highly recommend all of Wayne's classes, and this corporate marketing course is especially valuable. Wayne, only you can take a program like LinkedIn and bring it to life as if we were in front of the big screen enjoying our popcorn. There are so many valuable techniques available to all of us that use LinkedIn and your classes are run in such a way that when we walk out of the room we have that feeling that “I can do this thing"! So thank you for your unending love for the process and your customers in the quest to fully train folks in LinkedIn. Thank you for the passion!!!! WOW! What a great way to wake up on a Friday morning, travel through the aftermath of a snow storm, and be taught so many great principles about unlocking LinkedIn's CORPORATE marketing potential. I had NO IDEA that there were so many ways to promote your company on LinkedIn. Because of Wayne's completely unselfish desire to help others, he teaches an amazing class. If you want to market your company to millions of people for FREE, you need this class! Yet another inspiring seminar by LinkedIn evangelist, Wayne Breitbarth. The class offers inspiring insights into macro and micro marketing on LinkedIn. His proven processes give the framework for an immediate jolt to your online branding and marketing...including real world tips that are hidden deep inside LinkedIn's rapidly evolving interface. And best of all, Wayne's infectious energy and humor has you leaving with the absolute belief that you can really make a difference for your business.